All I can say is, "thank-you." Your prayers, advice, encouragement, and unorthodox ideas really helped. This morning, we left the house with one child strapped to the roof of the Suburban, fed the others Uncrustables, and very strictly enforced the 'you fight, you miss the next ride' rule. We also each said one thing we loved about someone else just to set the right tone this morning (based on how difficult this was for a couple of the children, we clearly need to practice loving our siblings much more). As you will see in the final picture of tomorrow's post, words cannot describe how much better today was. I'm trying to think of a fun (but not upsetting or traumatic) April fool's joke for tomorrow... But really I'm far too exhausted to think much further than the fantastic king-sized bed waiting for me. Well, the jetted tub also has some appeal. Love this condo we're in - love it! Can I be completely honest with you here? So far this trip has not been quite what I anticipated. Based on our experience last summer, I expected it to be a little less...um, unpleasant. Don't get me wrong - we all know how blessed we are to be able to be making this trip. And I certainly had no illusions that it would be easy. I just didn't expect it to be so darn hard. It seems the children - correction - one child in particular, just cannot get along. Driving in a vehicle for 8 hours a day, the whole while mediating the bickering and answering countless "moooooooom" requests is getting old. And the endless asking for things - hundreds of times over, even though they've been told that "we'll go swimming AFTER supper" each time - is also becoming a bit annoying. I don't want this entire vacation to feel like it's a big giant disciplinary endeavour. I want it to be F-U-N! I need help! Please, any suggestions you may have to limit the unpleasantness and increase the fun factor would be so greatly appreciated! - we have just started telling them that if they repeatedly ask for something that we have already answered, they will lose the chance to participate in that activity (to use the above example of swimming, if said child already knows we will go swimming after supper and asks again "when are we going swimming?" (with that lovely whine inflection with the question mark) that child will not get to join in on the swimming --- don't think we're cruel, because it's new we are still giving a warning. My point is, yelling into the backseat, "stop fighting already!" is proving to be less than effective. Ditto a number of other not-so-stellar parenting techniques I've engaged this week. So please - send help asap! We're overnighting in Arizona, just 5 miles from the South Rim of the Grand Canyon. We stopped for a peek before cozying up in our hotel - all I can say is wow. God is super amazing creative. It's beautiful and terrifying. Here's a little road trip recap (since I am too exhausted to write anything of substance). Day 1 - Home to White Sulphur Springs, Montana. Driving time (according to Map Quest) - 8 h 39 min. Actual time - roughly 10 hours. We spent the night in a cabin/motel room with 3 double beds and a teeny-tiny washroom. It was a looooong day and a short night. Day 2 - MT to Sterling, Utah. Driving time - 9 h 23 min (don't even ask what we were thinking with plotting out that one). Actual time - 12 hours or so. We stayed in a B & B on a hill. It was an astounding, massive, very old mansion (well, technically two mansions side-by-side) with original (or made to look like original) carpeting, lighting, pictures, etc. We had a family room where the kids had a bedroom with two queens and we got our own bedroom with a king. Ahhhhhh. After we left I realized I should have taken some pictures of the "classicness" of it. Pat told me his first impression was "old haunted mansion." I am soooo glad he did not share that with me when we arrived after dark...and were the only guests. Day 3 - UT to Tusayan, Arizona. Driving time - 6 h 38 min. Actual time - 8 hours. Initially, in keeping with my tight budget, we were booked in a room with two queens. Learning from the experience of the last two nights, I made the executive decision to get two adjoining rooms. Best $100 I ever spent. We are in our own room, watching TV, sipping a little bottle of wine (they sell wine in itty-bitty bottles like miniature beer bottles down here), and playing on the computer. All while 5 little monkeys sleep soundly in the next room. Lovely. Tomorrow - AZ to San Diego, California. We plan to spend 2 nights, and take the whole day Friday to visit Shamu and her friends at Sea World. I'm sure the kids will be relived to finally be doing something other than driving. Not much time to write on here this morning. We are packed, loaded, and will soon be ready to go. I am pleased to share that our vehicle looks much like this again, sans the carrier on top. (Sorry for posting an old pic from last summer's road trip, but it happens to be very chilly and snowy outside right now and I'd rather not go out there for just a picture. The fact that it snowed more than six inches in the past two days really makes it all the more special to be heading to California, dontchathink?) 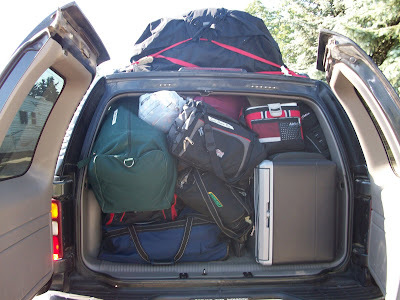 I don't know how he did it, but that husband of mine has a special gift - he fit a large cooler, two food bins, 4 large duffel bags (think junior sized hockey bags) with clothes, and two smaller duffels all in the back of the Suburban. Granted, the review mirror is now simply a windshield decoration. 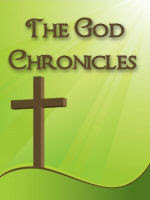 The God Chronicles is a place where I journal out the ways I have seen God working in my life. Because I believe in the importance of documenting this stuff for our children and their children, it is an open blog carnival - anyone can join in. For details on the inspiration behind TGC, read this. Write a post for TGC on your blog (or if you don't blog feel free to leave a really long comment), go ahead and use the graphic if you want to, be sure to link to THIS POST in your blog post (to send people back here for linking up and reading other TGC stories), then put your name and the URL for your blog post (please use the perma-link for your specific post, rather than linking to your whole blog - this makes it easier for others to find what you've written), and don't forget to leave a comment here and everywhere you visit. For all the specifics and rules and such, read this. One of my favourite things is to see my children growing in their faith. I love seeing them raise their hands in worship, or talk about God like an old friend, or act in a way that shows me they have taken God's Word to heart. It gives me a warm fuzzy (or teary chokey) feeling to hear one of them say, "Jesus is my best friend! He loves me!" Recently, Abbey (7) has been struggling with fear at night. She's afraid of a fire, and that they would not get out. She's afraid of spiders or other insects crawling on her as she sleeps. She's afraid of the shadows and the dark. The crazy thing is, I can see the fear in her - it's tangible, real, and powerful. It has been bringing her to tears and trembling at bedtime for nearly two weeks. Pep talks are not helping. Ignoring it is impossible. Praying with her seems to offer only temporary relief (usually she's out of bed, nearly hysterical, within an hour). But we decided that we could not afford to let this fear gain victory in our home! So Pat and I came up with a strategy. At bedtime, we pray with authority in Abbey's room and over her heart and mind. We renounce the enemy and seek His hand of protection. And then, we coach Abbey in speaking God's Word for herself. It's a repeat-after-me sort of thing from Joshua 1:9, "I AM strong and courageous! For the Lord MY God is with me wherever I go!" On the third night, Abs proclaimed it for herself, with no help from us. Each night that we have gone through this process, she is smiling by the end of it - and you can tell she is feeling safe and strong. No night waking, no talking of fearful dreams in the morning. Absolute freedom from the fears that were practically debilitating her. Freedom because of God's Mighty Word. When he went to school the day after his birthday, Braeden asked Shea (3) to babysit his Bakugan. When he got home from school, they were missing. Despite my assurances that we would surely find them somewhere in the house, Braeden was pretty broken-up - after all, they had not been uncovered after nearly an hour of searching. 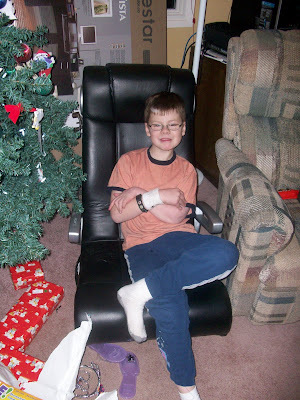 At bedtime that night, Grandma prayed with him, and they asked God to help find the missing toys. Three minutes later, as she was tucking Shea into bed, it occurred to her to reach behind the bed. Low and behold - the precious Bakugan were tucked snugly where they had last been seen as Shea laid down for her afternoon nap! Grandma was excited to share her discovery with Braeden, and had already forgotten that they had prayed about the toys. But Braeden - he remembered. He was shouting and clapping his praises to the God Who Answers Prayer, "Yay, God! Yahoo! You rock, God! Awesome. Thank-you, thank-you, thank-you, Jesus!" In our world, there are so many versions of the truth. We hear that "what is true for one person may not be true for another." We are always looking for the truth, seeking what is real, but the world tosses so many easy substitutes our way. These pretend gods are so appealing to us, because in our hearts (in mine, at least) we are lazy. And these gods are palatable. These gods don't require us to give over our lives in love; these gods don't require us to change our behaviours and attitudes; these gods don't require us to draw a line in the sand ethically. Unfortunately, these gods are impotent. The "god self" has no power to rescue us, to change us, to transform us. There is one true God, one Sovereign Ruler, one Creator, on Saviour. Truth can only be found in Him. He binds up the broken-hearted, He heals the sick, He delivers the addicted, He convicts the wicked, He has mercy on the weak. He fills our hearts with joy and puts songs of praise on our lips. This power can only be found in Christ. And Christ can only be found in the Bible. If you are searching for what is true and real, you will find a lot of books and movies out there. Many of them sound close enough to what the Bible says that we easily accept them. Many of them sound just that little bit "easier" than what the Bible says, so we embrace them. Many of them offer promises of freedom/change/contentment from whatever plagues us by following the prescribed steps contained within their pages. But you will not find truth there, you will not find freedom. If you want a self-help book to quit yelling (I know I do), there is only One Book that offers the secret to really changing. If you want to quit smoking in ten days, the Bible is the Only Book that promises (and means it) real power to change. If you want to find a way to get over the pain and loss of a divorce, the path to truly healing those hurts and finding peace and joy is offered (with an absolute guarantee) in the pages of The Good Book. Any other book you read, podcast you listen to, or movie you watch - unless it directs you back to the pages of the Bible - is offering a cheap alternative that will only bring temporary freedom. I pray also that the eyes of your heart may be enlightened in order that you may know the hope to which He has called you, the riches of His glorious inheritance in the saints, and His incomparable great power for us who believe. That power is like the working of His mighty strength, which He exerted in Christ when He raised Him from the dead and seated Him at His right hand in the heavenly realms. No cheap alternatives here. No simple fixes. No feel-good solutions. But for those of us who believe, the same power that raised Jesus from the dead. Real, true freedom from the real (and only) truth source. Please get ready for school. Get dressed. Brush your teeth. What do you want for lunch? No, I don't have tomato soup. I'm sorry, we're out of alphaghetti. How about a sandwich? No, didn't I just say we're out of that? How about a sandwich? No, you can't just eat chips for lunch. How about a sandwich? Excuse me, aren't you supposed to be getting dressed right now? How about you play with the dog once you're ready for school? Please don't shout at your sister. That's not how we treat our friends and family. If you continue to shout you'll have to go back to bed. Don't forget to put your socks on. Then you can go brush your teeth, please. No, I already made you a sandwich. You can't have alphaghetti because we don't have any. Hello? Can you please stop daydreaming and put your socks on?! It is also unkind to "shush" your sister. Please speak kindly to your family. No! Don't touch the dog food! No, No - Ta, Ta. Spit it out, that's yucky. Okay, you need to go back to your bedroom for a few minutes. This is the third time you've been unkind to your sister. I will call you in fifteen minutes and you can start again. Okay, now go brush your teeth please. The sandwich will be fine! Seriously. No, you cannot come out of your room yet. I will call you when your time is up. Are you brushing your teeth? I will not discuss the lunch any longer. Perhaps if you had done your job and gotten it ready last night you could have had something else. But for today you will take a sandwich. Don't fight with your baby brother, please. No, no. Don't hit. That's owie. Be nice to big sister. Give her a hug. No! Don't hit puppy either. Hitting is owie. Be gentle. Why haven't you brushed your teeth?! Today you are another year older. Eleven years old. Wow. I remember you as a little baby in our little two bedroom apartment. You liked to sleep in the laundry hamper on top of a pile of fresh-out-of-the dryer clothes. I can't count the number of quarters I spent warming up clean towels in hopes of coaxing my colicky little man to sleep. I remember they told us you would never be "normal," that you might never walk, or talk, or be able to go to school. In some ways, those doctors were right - you are far from typical - you are extraordinary! I cannot imagine you any different than the person you are today. In other ways, those doctors were so very wrong. I praise the Lord for the things you are able to do! You are such a smart guy, with a witty sense of humour (just like your dad). I have loved seeing you grow and mature this year. You are becoming so confident! You are a leader in your school, with your siblings, and at church. It makes me very proud to watch the way you make an effort to help other kids feel welcomed and included. The fact that you won the "Heart of Gold Award" at school holds greater meaning for me than any report card ever could. You truly do have a heart of gold...and a heart for God...and it makes me smile. Braeden, I hope that you know how special you are to me. My first born baby, my big boy. I love you, son. Happy birthday. I am at a women's retreat this weekend. If you've never attended one of these, you may be imagining a bunch of old women sitting around a table, praying for hours. You couldn't be more wrong! This is my sixth year - in a row - attending a women's retreat. I expect to continue to do so, on an annual basis, for the rest of my years. I come to these weekends with a few expectations in mind: I expect to stay up too late giggling with girlfriends; I expect to fellowship deeply with other Christian women; I expect to be given the opportunity to minister to other women; and I expect (and highly anticipate) the fantastic food NOT prepared by me! My greatest expectation, though, is that God will show up. And He never disappoints me! I was sharing with a girlfriend about my struggle with weight loss. I was talking about how difficult it is to stick to a program... I tend to be a bit of a perfectionist. I want to do everything completely and perfectly. If it's exercise, I need to do it every day for an hour. When I miss a day, or peter out at half an hour, I mentally toss my hands in the air and think, "why bother?" If it's eating, I need to eat healthy all day and all week. When I catch myself caving in to temptation and popping a Milk Dud in my mouth, my immediate thought is, "well, I've screwed it up now, may as well throw in the towel and eat the whole box." I am not willing to settle for anything less than absolute success - perfection. My friend and I had a mutual giggle at our "eldest child" personalities and moved on. We pretty much accepted that this is just the way we are, it's both annoying and funny. The end. God, though, He won't settle for that excuse! "Just the way you are?" Nuh-uh. We sat down in the teaching session a couple hours later - our topic is truth, what is the truth? Our speaker, Cynthia Cavanaugh, says, "God doesn't expect perfection, He just expects us to be faithful." She proceeded to say it again (you know the way speakers will do that with important points, so we really hear). I was listening and nodding, but not really listening with my heart. Then that girlfriend caught my eye, and I realized that God had just spoken. God does not expect perfection from me. Why in the world would I walk around in this life, then, expecting something from myself that He has never asked? I do not need to be perfect. I just need to be faithful. My mind flooded with memories of how God has been trying to give me this message over the past week - other women telling me to just try doing one little thing at a time (like choosing an apple for my afternoon snack rather than potato chips), my husband encouraging me to just do those little things that are easy to do (like grabbing 10 minutes of exercise here or there), other women sharing with me how they have been fighting through their own perfectionist tendencies. They just kept coming! It is such a simple truth that I nearly missed it. In this life, perfection will not bring victory over my struggles. Faithfulness is the only thing that God has called me to. If I am faithful to Him - in how I treat my physical body, in the little changes He asks me to make to avoid anger, in how I respect and honour my husband, in how I relate to others, in how I spend time with my children - He will make change. I don't have to revolutionize myself. I don't have to dive right into "Extreme Makeover: Physical, Spiritual, Emotional, ahem Perfectionist Addition." In fact, I don't have to change my bad habits and junk at all! I simply have to do what He tells me to do. You might be tempted, as I was, to overlook this truth. It's so simple that we all KNOW it. But just take a moment to ponder it... Our God does not expect perfection from us. Is there something in your life that you've been wrestling with? Some habit you've been trying to kick? Some heart attitudes you keep attempting to change? Anger? Panic? Lying? Smoking? Weight loss? Saving your marriage? Are you like me - you try and try to do it all, and when you fall short of the perfect standard of complete transformation you say, "I screwed it up now anyway, may as well just stop trying."? That, my friend, is a lie from the pit of hell, designed to keep us from the victory Christ promises us. God does not call you to be flawless. He simply asks that you be faithful. Why are you asking more of yourself than God asks of you? Imagine how freeing it will be to stop holding yourself up to a standard that you do not need to achieve! Frankly, I am breathing a big sigh of relief. I don't know about you, but I find that there are times where my prayer life is lacking in direction and intentionality. I'll be there in my morning prayer time, and I feel as though I have nothing to pray about - which is ridiculous, because there is SO MUCH to pray about. Because I'm an administrative type girl, I've found a handy way to keep myself focused in prayer. It all starts with a calendar and a list (are you really surprised that I make a list?). I begin by making a general list of the things/people I want to be praying for regularly. My list is something like this: kids, marriage, ministry, unsaved friends/family, church leaders, government leaders, and so on. I make sure to leave lots of space under each of those topics. Next, I add details to the list - specifics for each of those general things. For example, under kids I would list: spiritual growth/salvation, health, integrity, future spouse/marriage, spiritual gifts, areas of struggle. Under marriage: protection, growth, passion, that I would be the wife God wants me to be, areas of struggle for either of us, unity (in general things and in parenting), finances, etc. Under ministry: each area of women's ministry (there are six or so), each leader of those areas, their marriages and families, their teams, areas of struggle, etc. Then I set my big list and my calendar side-by-side to look for a handy way to plug everything in (it seems that my list is about the right length to fill a two-month schedule). The first thing I want to plug in is that which I know I want to be praying for daily - my marriage and my kids. The kids are easy, because there's five of them - Braeden on Mondays, Abbey on Tuesdays, Megan on Wednesdays, Shea on Thursdays, Malakai on Fridays. Then I assign a "theme" to each week based on the list of prayer topics under the heading of kids (so each day of that week I will pray for the assigned child on that topic). For help in focusing my prayers for our marriage, I'll often take topics from "The Power of a Praying Wife" and plug one into each week. As well, I will take the list of topics and spend a day or week on them, depending how I feel led to plug them in on my calendar. There are a lot of great books on building a strong marriage that provide topics (and even daily tasks) that I use to help direct my prayers in this area. I also know that I need to be praying for ministry regularly. I find that the easiest way to remember is to plug each ministry area in on the day of the week it occurs - so, Monday night Bible study on Mondays. Over the month, I'll typically assign one Monday to pray for the attendees, one Monday to pray for the leader and her marriage, one Monday to pray for her team, and the last Monday to pray generally and however I feel led. And to round off my prayer calendar, I add in the remaining items from my list. I try to take one day of the week to pray for unsaved friends and family. Our pastor once suggested that we focus our prayers intently on three people we want to see saved, so every other week (usually on Fridays) I spend time just praying for the same three people - there has been one person on that list for years now. The alternate weeks, I just let my heart and mind run through everyone I think of, tossing names and prayers to God for all of them. I try to plunk in one or two days in a month for each of the other topics, such as church leaders, political leaders, and anything else on my list. I pop my two months of prayer calendar in a duotang, and set it in my "quiet spot" alongside my Bible and whichever Bible study book I'm working on. I know this method won't be for everyone. There are some people who would feel restricted, stilted, and frustrated by so much order in how they pray and who they pray for. But if you're like me, and without a list of "to dos" you wander aimlessly doing nothing, a prayer calendar might be just what you need to keep your prayer life on track. In fact, I find this method to be so handy, that I'll probably link back to it next week for Works for Me Wednesday! Life is hard. Can I get an "amen" to that? Do you ever hit a wall? I find that at some times in my life there are certain things that just plain wear me down. Eventually, I come to a place where I'm crying out in prayer, "Lord, I can't do it anymore. I'm so tired. Please make this battle end." When relationships go sideways, and it seems that there is no way to repair what has been broken; when I feel that no matter how I try to make things right it will never be right again - I want to give up. When the demands of life (motherhood, ministry, housekeeping) all crowd in around me and clamour for my attention, and I feel as though I could not possibly meet one more demand - I want to quit. When the same struggle, the same sin, the same anger keeps rearing its ugly head and I feel out of control - I want to throw in the towel. Lord, I can't do it anymore. I'm so tired. Please make this battle end. You may remember me saying that some people aren't called to rest, or sabbatical, or whatever term you'd like to insert - rather, certain people are called to persevere through the times when they feel overwhelmed. In case you missed that one, let me just shout it out - certain people are called to persevere through the times when they feel overwhelmed. and 4. bitterness and unforgiveness - allowing our hearts and spirits to be clogged up with junk. The question in your mind (and mine) is this - how do I persevere? What does that look like? What do I do? so that you man know and believe me." Victory is wrapped up in knowing and believing God. To know Him simply means to turn your attention toward Him. To believe is to trust. There's no magic formula, no miracle cure. As in most things, moving past your "stumbling blocks" requires making a choice. Choose to be weak, weary, and defeated. Or choose to KNOW and BELIEVE that Your God is bigger, that He can deliver, and that He will claim the victory. Every family has some guiding principles to help them figure out (and do) what's important. It also helps them to not do what's not important. We've got a few rules that the whole family knows as well as a few themes that the parents keep in mind. - When it comes to activities, each kid can only be in one thing at a time. We're happy to let them experiment with different types of activities - but it may take a couple years for them to have a shot at each sport or class they mention joining. - Our children do not have permission to wear certain clothing now that we would not find appropriate when they're pre-teens and teens. For example, bikinis - quite adorable on little ones, far too "sexual" on adolescent girls. I hate to take away privileges for no reason, or change the rules last minute, so it makes it easier for everyone to have the guidelines of modesty firmly established now. - If we need to decide about something, we ask God. School, work, how to spend money, etc. We just don't feel that these decisions are "ours" to make. - We are working on a new rule - no interrupting. With a large family, it can be a scramble for everyone to get their say...but we've run into a habit where the children can say "mom" or "dad" while we're in the midst of conversation and we turn to them and say "yes?" We feel that it's important for our kids to know that, as a couple, we value each other and what the other has to say. Also, interrupting is simply a rude habit! Do you have any rules or guidelines, spoken or unspoken, that help keep your family on track? A blogger friend of mine, Mary from Owlhaven, has written a book. This is a book that I want and need, I must have it! The title - A Sane Woman's Guide to Raising a Large Family. My family isn't as large as hers, in fact she has double the kids I do. And sane? I am not. Perhaps that is one of the pressing reasons I must have her book. If you think it looks good, even if you're not what would be considered a "large" family, you can visit her giveaway post right here and enter to win. Or, if you're not interested, you can visit her post and enter me to win again. (Feel free to do so every week for the next four weeks. Okay? Thankyouverymuch. Have you ever done that exercise where you try to capture who you are and how you lived your life in short captions, like how you would want your gravestone to read? I recently told my husband that if we were to develop a family mission statement I would like it to include the phrase "radically obedient." Because obeying the Lord as soon as He speaks, without question, even when it seems insane (like Noah or Abraham), is a trait that I want to characterize our family's faith journey. That is how I would like to be remembered. She invested her life in following wherever He led. She loved, she lived, she followed God all the days of her life. God's love shone through her actions as a wife, mother, and friend. What would you like your stone to read? Changing your life happens not by making drastic and dramatic changes, but by doing small things that, over time, make a big difference. These are things that are not difficult to do, but they are easy not to do. For example, exercising for ten minutes each day is not very difficult to do. But it is certainly an easy thing NOT to do. It is a small thing, that, if done repeatedly over a period of time, will change your life. Ten minutes of exercise per day is enough to help an overweight person lose half a pound per week, Over time (say a year), the result is twenty-six pounds lost. Making small choices - choices that are not difficult to make, but could be easy not to make - can lead to big life changes. What small things are you not doing that you could/should be doing? For me, an obvious one is exercise (even just a little bit). Not only because I would like to lose the same weight I've been talking about losing for a year, but because my back will feel better, I will feel more confident, I will have more energy, my moods will be more easily regulated, I will sleep better, it will lead to making better eating choices, and inevitably I WILL LOSE WEIGHT! Another small thing is putting up scripture on index cards throughout my house. I've been talking about doing this for years. Imagine a home where there are pieces of God's Word in every nook and cranny to help keep the heart focused on what is good, right, and praiseworthy. A small thing that really would not be difficult to do, but has been oh-so-easy to not do.